So the waiting period is officially over. The illustrious Shawn Fogel has brought us some new dishes of indie-pop deliciousness to dribble over. Indeed, the comeback of Golden Bloom is, on the surface, a simple EP. But March To The Drums is far from just a collection sample tracks to hold you over until something better comes along. This is the “better” that came along. It is the sort of miniature opus we can always expect from Mr. Fogel. Although each track has it’s own individual spirit residing with in its powerful and glitzy ballads, one track would not work without the help from the preceding or the following track. Individually, “Rhyme The Reason” is definitely the highlight of this beautiful batch of hook-heavy melodies and whistling vendettas toward the mundane. But, even a highlight-worthy track such as this one can not take away from the greatest noticeable quality of March To The Drums – being all around wonderful, especially when played straight through. You could actually miss the transition from the star track, directly into “You Go On (& On)” if you allow yourself to be lost in complete adoration of Shawn’s wonderfully told tales of human existence at it’s finest, or most humble. Which would be completely rational by all means. 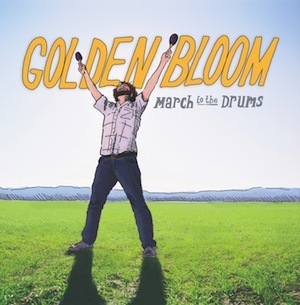 March To The Drums finds Golden Bloom in a sort of paradox-like state from previous efforts. 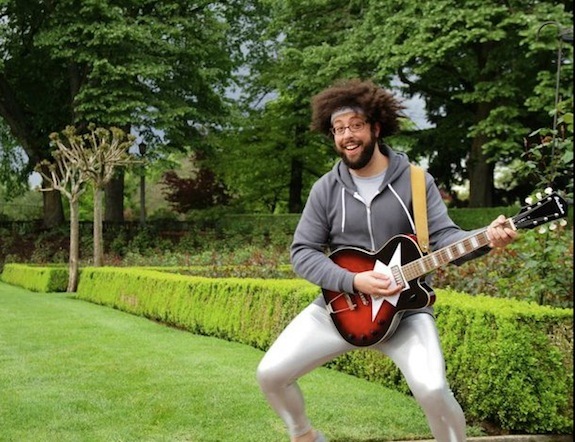 Although we could come to expect happy go lucky indie show tune like qualities (which we all adore). For those who might likely remember in what might have been Fogel’s “darker” (yet, not really that dark at all) sound with his single “Fight At The End of The Tunnel”, and miss it a bit, you have a small taste here. Although a better comparison would be to the other favorite, “Doomsday Devices”. But alas, we find our man somewhere in the middle of these distinctive sounds. Obviously leaning a bit more to the lighter side of things, yet not completely withdrawn from an intense seriousness that is always good to have on hand. No matter, here we find the continuation of genius that we have come to expect from Shawn Fogel. He definitely succeeded with this one.